Open House this Sunday from 1-3 pm in Lake Claire in the Mary Lin School District! 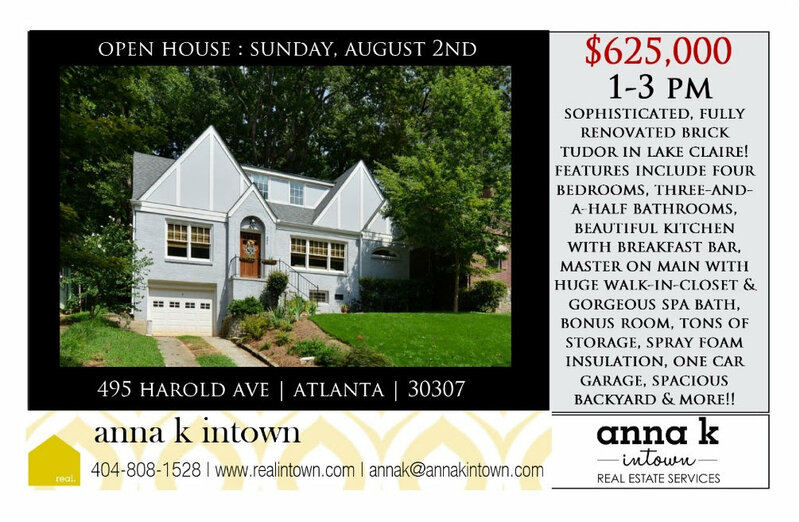 Come check out Anna K Intown’s adorable new listing at this sophisticated tudor in Lake Claire, Atlanta Georgia. One Atlanta’s most walkable neighborhoods! Strong elementary with Mary Lin feeding to top Inman Middle and Grady High School! Need a cold drink in this summer heat? Walk to the Candler Park Market or Flying Biscuit for a cool down or snack! Please stop by or share with any of your friends or colleagues who want a top notch house in this hot Atlanta Real Estate market! Get it while it’s hot (the house that is…). Oh, did we mention this is the home of many Atlanta’s spring and fall festivals, close to Marta, and a hop skip to downtown Decatur, GA. I’m thinking this is the one for you! Park facing custom modern prairie or modern new build opportunity in Candler Park! Open House this Sunday in Kirkwood from 1-3 pm!